Throwing out ideas is like scattering seeds … if they land on fertile ground they sprout. With nurture, light and love, they grow. Fact. I do it quite a lot…being a farmer and an artist, it’s part of my job description. In the art world people constitute fertile ground….I travel a lot and meet a lot of people, a lot of people travel and meet me. It’s not every day you meet people from Kazakhstan though, so when I met Zarina, a media save, energetic, arts orientated, marketing diva, a couple of years ago in Italy, of course I throw out some seeds – “If any interesting sculpture projects come up in Kazakhstan give me shout! 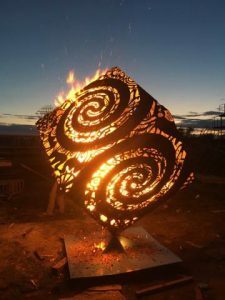 ” 18 months of gestation later – it’s March, Zarina messages: “How would you like to come to Astana to make a fire sculpture for the Astana Arts Festival “Nomad Energy” for the World Expo-in June? 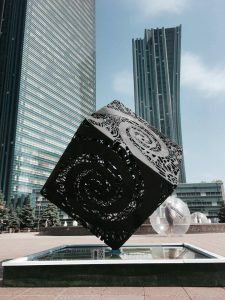 It’s June, I am here in Astana, my sculpture is made and it has been placed on the central boulevard of Astana, the Nurzhol, for none less than the Akim (mayor) of Astana to light up for the opening of the festival tomorrow. There has been no struggle, no artistic angst, in fact this has been one of the easiest sculpture projects I have ever made, the flow between commission, conception, creation and completion has been clear, clean and concise. Tagdyr or solai one might say in Kazakh. It was destined. The only way I could surrender the time required for me to come all the way to Kazakhstan, was by making this an opportunity to use the new to me technology of laser cutting. Hence, we decided to make a Fire Cube, so my designs could be cut out of steel sheets before I arrived. 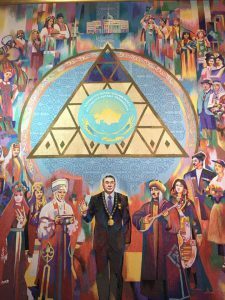 The brief was very open to my interpretation: “Symbols and images that will inspire Kazakh’s to feel the spirit of their nomadic past”. Perfect, there are few things I enjoy more than researching ancient petroglyphs and still pertinent symbolic images from 1000’s of years ago. My hard work – was my pleasure. I sat for a week of mornings on my balcony drawing a mélange of pre-historic petroglyph designs, from various parts of Kazakhstan, blended with a healthy selection from my imagination. The technical hurdle of converting my images to CAD were overcome with a gift of the gods – a new friend from Bosnia, Valentin, who has worked in the programing and laser cutting industry in the US. Delivered to the door a personal genius! The logo for the event had already spoken to me from the outset, a strong flowing spiral design, embedded with ancient images…a match was made, and my cube came to life to deliver a message of inspiration to Kazakhstan. Interesting micro to macro observation really…that an art piece designed in one of the smallest islands of the world should now be placed centre stage in one the biggest nations of the world, the 9th biggest in fact. So, it be. The CAD files where sent to Zarina and then passed on to the metal workers, who duly cut them a few days before I arrived. The day after arriving in Astana it was a joyful feeling to be driven out of the city, to a rough and ready metal workshop on the edge of the steppe, to see the laser cut panels being welded together. The integrity of the cut line was amazing and bar a few errors we had made in the CAD, it was as close to perfect as I could have dreamed. Wow…none of the grunt work, sparks and fumes on this one – the way forward is finally clear in my mind for international sculpture production. Rustem, the chief metal worker, was visibly proud to have delivered on time and, likewise for him with relative ease. His crew of rough and ready lads, were stoked and when we did our first test out in the fields on the steppe I bought them a few beers and we had a mini celebration whilst the cube burnt. The energy was strong and the effect is taking hold….onward to the city of Astana! Hahah. Epic, bro! Keep up the good work! Glad to read you made a step into future and into the domain of lasers. Next fire monument will be surely shot to SPACE.